Mac Arnold and Plate Full O’ Blues is a blues band that brings back the authentic “down home” blues deeply rooted in the tradition and legacy of the Muddy Waters Chicago Blues Band of the 1960’s in which Mac Arnold played bass. Mac had brought to Chicago a new bass beat from the root music in the Piedmont of South Carolina - a beat influenced by the combination of gospel and country music. During this time, Mac played with some of the very best in rhythm and blues, including the young James Brown and the Charles Miller Band. In 1991, a young harmonica player steeped in the blues - Max Hightower - discovered Mac on his family’s farm in Greenville County, South Carolina and learned that he had played with Muddy Waters. Max pursued him for ten years before Mac finally agreed to return to the blues with a group of very talented young white musicians who recognized what Mac’s musical history of playing with the blues greats could mean to them and their passion for the blues. 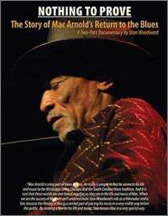 This is the Southern Americana story of the band and the step-by-step progression of Mac Arnold’s remarkable return to the world of the blues told by award-winning documentary filmmaker, Stan Woodward. Stan bonded with Mac and the band and provides us with an intimate “inside” look at the blues world in the 21st century through his signature hand-held camera as he follows Mac each step of the way.